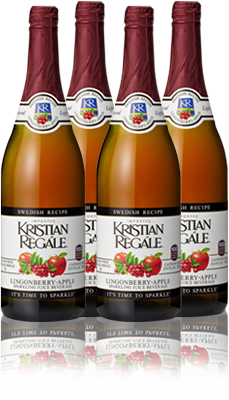 For a tangy, delicious, refreshing taste, try Kristian Regále Lingonberry-Apple Sparkler. It’s made with real lingonberry juice from Sweden. Handpicked in the Swedish countryside and forests, these small berries are cousins to the cranberry. Purified sparkling water, apple and lingonberry concentrates, beet sugar, natural flavors, citric acid.